In all the past World Youth Alliance (WYA) events I have attended, the number one reoccurring theme (almost like a rule) for me was to have fun. This, for me, was one of the factors that kept bringing me back. But as I joined more WYA events I began to realize that the fun in WYA was uniquely fulfilling and ultimately purposeful. From then on WYA became one of my guiding lights that I was inspired to join many more WYA events, especially the WYAAP Summer Camp. I still remember the camp like it was just yesterday when my classmates and I arrived at the resort in Antique after an early morning five-hour drive. We were greeted by old friends and, as what usually happens in WYA events, we made many new friends as well that in the process, my idea of the world as an enormous place was consequently reinforced. But more realizations were to come when we started divulging the Certified Training Program (CTP) lessons–the main meat of the WYAAP Summer Camp program. Honestly, when I first saw the CTP manual (a thick book), I was quite intimidated by its three hundred and ninety-nine pages. In addition to that, I was not able to piece and fully understand some concepts when I started reading its many articles. Despite these struggles, however, I managed to understand the importance of the human dignity and its manifestations with the help of my facilitators and fellow campers. 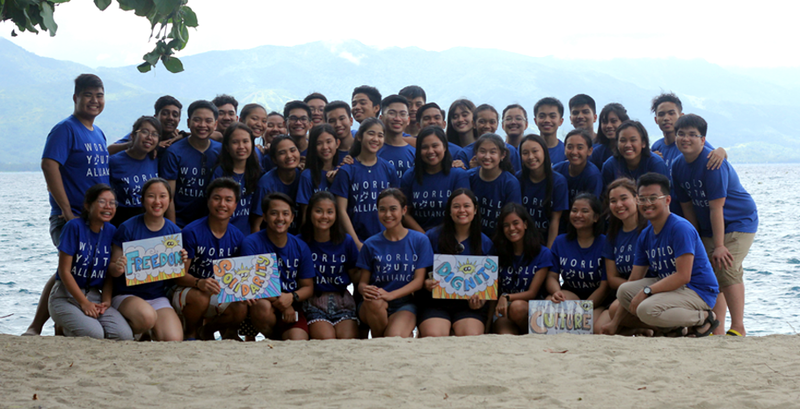 From then on I realized that the CTP manual’s purpose was not to only teach us about the foundational ideas that make up the World Youth Alliance, but more so to instill a bond among new friends. This bond would prove useful since it made all of us campers realize that to reach our common goal (which in our case was to pass the accreditation interview exam at the end of the camp training), we had to work together. The importance of teamwork was one of the recurring themes in the manual which made me realize that one WYA member can only do so much; but if one person such as myself works alongside a family, that person will effectively reach their goal. The WYAAP Summer Camp lived up to my expectations and in a way even exceeded them; the fun factor was present in the many activities and discussions prepared by the facilitators. And although I could hardly consider the CTP final exam fun, I had my teammates, facilitators, and fellow campers to thank for making the experience much bearable. Overall I do not think words or even my article can give justice to what the WYAAP summer camp is like, so I guess you’re going to have to find out for yourself. When you do, I promise you will not find an organization more compassionate and determined as the World Youth Alliance. Here's to a Wonderful Summertime! I clearly remember that time I was checking the web and found the website of World Youth Alliance.